Postdoctoral fellow Jacob Zahn successfully defended his thesis! The Biophysics Department welcomes a new employee! Luciana de Oliveira joined the lab from the Università di Bologna. The Department welcomes new primary faculty member Svetla Stoilova-McPhie! Thomas Scheuermann has left to take a position with GE. Best of luck to you Thomas! The Biophysics Department welcomes two new employees! Bruno da Rocha-Acevedo joined the lab from UTSW’s Cell Biology Department. Nagesh Peddada has joined the lab from the UTSW Department of Pharmacology. Baoyu (Stone) Chen has left to take an assistant professor position at Iowa State University. Good luck, Stone! Postdoc Mark Kittisopikul in Khuloud Jaqaman’s lab has been named one of two recipients of the one-year UT Southwestern Wellstone MDCRC Training Grant. Congratulations Mark! The Biophysics Department welcomes new secondary faculty member Youxing Jiang! His research focuses on the structural and functional studies of ion channels and transporters. Jose Moreno Beltran comes to UTSW from the University of Seville, Spain, where he received a graduate degree in biophysics. The Department welcomes new secondary faculty member Xuelian Luo! Alex has moved on to UT Austin to study law. Good luck, Alex! Bradley has taken a new position with BioRad. Good luck with the new job, Brad! The Department welcomes new primary faculty member Jan Erzberger! The Department welcomes new primary faculty member Kendra Frederick! The Department welcomes new secondary faculty member Milo Lin! The Department welcomes new secondary faculty member Daniela Nicastro! Postdoctoral fellow Alexander Piala successfully defended his thesis! Postdoctoral fellow Soyeon Kim successfully defended her thesis! Postdoctoral fellow Sudeep Banjade successfully defended his thesis! The Biophysics Department welcomes the following employees! The Mike Henne Lab has two new postdocs. Hanaa Hariri was previously at Florida State University, Tallahassee. Yang (Lydia) Liu came to UTSW from University of North Carolina, Chapel Hill. Anat Gharpure previously studied at Brown University. Graduate student Felipe Andres-Piedra successfully defended his thesis! The Biophysics and Biochemistry Departments hosted the 2014 interdepartmental retreat on Nov 7–9 this year. The Biophysics department sponsored three finalists for the Sara and Frank McKnight Undergraduate Prize in Biophysics. Competition was tough this year with many qualified applicants. It is very encouraging to see such potential from the next generation of scientists! Postdoctoral fellow Alpay Seven successfully defended his thesis! Postdoctoral fellow Kyle Brewer successfully defended his thesis! Postdoctoral fellow Da Jia (Rosen lab) is leaving us for his new job as an Assistant Professor at Sichuan University in Chengdu, China. Congratulations, Da! Postdoctoral fellow Arati Ramesh (Gardner/Winkler labs) is leaving us for her new job as a Reader (equivalent of tenure track Assistant Professor) at the National Centre for Biological Sciences (NCBS) in Bangalore, India. Congratulations, Arati! The Department welcome new secondary faculty member Mike Henne. Read about Mike and his research here on the Henne Lab website. Graduate student Yuxiao Wang (X. Zhang Lab) is off to his postdoc with Ron Vale at UC San Francisco. Yuxiao’s work in Ron’s lab will be funded by a Jane Coffin Childs fellowship. We will miss you Yuxiao! Best of luck in your future endeavors. 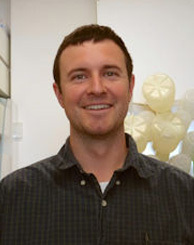 Postdoctoral fellow Jon Ditlev (Rosen Lab) was awarded an NIH postdoctoral fellowship. Congratulations, Jon! The Department welcomes undergraduate SURF students and new graduate and MSTP students doing summer rotations. First-year Molecular Biophysics graduate student Beth Geyer (Rice lab) was awarded an NSF predoctoral fellowship. Two other first-year Molecular Biophysics students received honorable mention. Congratulations, all! The Department welcomes new secondary faculty member Kim Reynolds. Read about Kim and her research on the Reynolds Lab website. Another year, another joint departmental retreat with the Biochemistry Department! The Biophysics Department hosted the three finalists for the Sara and Frank McKnight Undergraduate Prize in Biophysics. Congrats to all and best wishes for the future. It is always a pleasure to meet such talented young scientists. Three finalists (l-r); Allyson Rice (UT Austin), Thomas Alderson (U. Wisconsin), Michael Clark (Northwestern U. ), and Kevin Gardner (UT Southwestern, host).